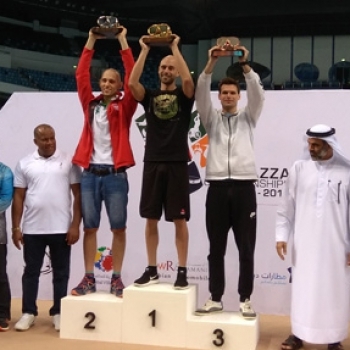 Fazza Championships 2016 in Dubai and new personal best in STA! On the beginning of March I flew down to Dubai, UAE to take part in the Fazza Championships. This was my second time competing in these Championships. The rules are a bit different than the usual AIDA rules, so last year I tried taking part to test myself in this new environment. You can read about my last years’ attempt here. The competition took place on March 3 - 5th, 2016 in Dubai, UAE. 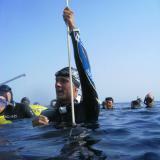 The Fazza Freediving Championships are meant to remember the ancestors of the Persian Gulf inhabitants, who were diving to collect pearls. This year around 200 freedivers arrived and the athletes competed in a deep pool, where you should go underwater and hold your breath. This kind of static is totally different than the one usually performed in AIDA competitions, because you still need to surface from a few meters after you hold your breath for the maximum amount of time. This year I knew what expect, so I was definitely better prepared than last year, which was visible in my result: I set a new personal best record and finished the dive with an official result of 08:29 minutes. A real success for me is knowing that I did what I was prepared for. It's nice to get a medal, but in my athletic development it's most important to surpass my own limits. The result I got in March proves that I'm on the right path to have some more victories over myself.